We mark the difference because we enter the old royal palace and the rest of the interiors since the visit includes the entrance to the castle. An essential tour of the most visited monument in the country. 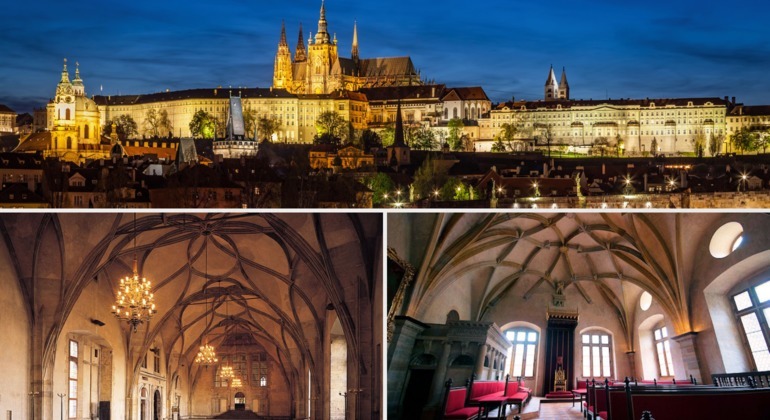 We will have the pleasure of knowing ALL the interior of the cathedral and see all its chapels, highlighting the chapel of St. Wenceslas decorated with thousands of semiprecious stones. We will also enter the interiors of the Royal Palace through its rooms: the Vladislav hall, the largest medieval hall of the time (63 meters long, 16 meters wide and 13 meters high), Ludvík's wing, the register decorated with 189 shields of scribes and replicas of the jewels of the Czech crown. We will enjoy the interior of the Romanesque Basilica of San Jorge of the year 920. We will walk along the Calle del Oro, entering the colorful houses, the torture rooms of the Daliborka tower, the workshop of alchemists and potters. Of course, we will see the changing of the guard. At the end we will go down through the Malá Strana neighborhood, discovering the most emblematic places on that side of the city and ending at the imposing Charles Bridge. LOOK FOR THE BLACK UMBRELLA - VIVE PRAGA TOURS (VIP tours). Meeting point is located in the Old Town Square 5, Cartier, Prague 1. -Metro line A (green line), stop Staroměstská, and 4 minutes on foot. -Tranvia, Staroměstská stop (lines 2, 17 and 18) and 4 minutes on foot. -Bus 194, stop Staroměstské náměstí. VIP because most of our tours are exclusive and all with small groups, with a maximum of 16 people, without a speaker or headphones with personal and close attention.